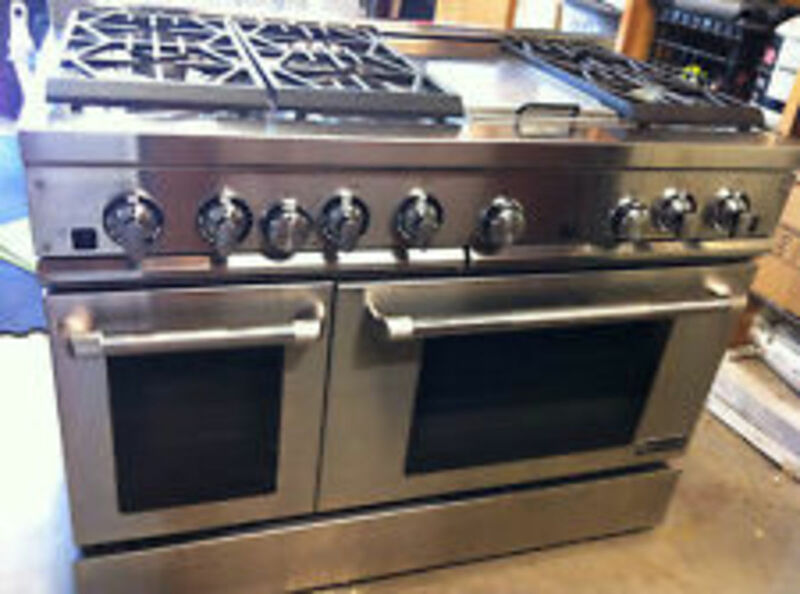 .Double ovens with a separate cooktop. Cooking appliances separated and built-in. If you have read any of my other articles on kitchen planning & design, you know I am extremely annoyed by non-functional design and bad product choices. Most of what bothers me comes from simple uninformed decision making and/or novice designer mistakes. This capsule is all about your choices for cooking appliances...costs, function and aesthetics. The kitchen pictured above here is a great example of built-in appliances. 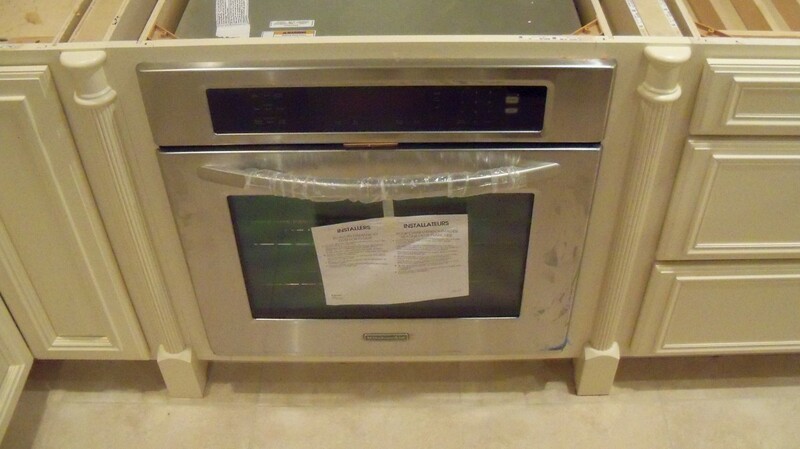 What you see are 3 appliances (ovens, cooktop and microwave) bought separately and placed independent of each other.The exhaust venting you don't see because it is concealed behind the elaborate cabinet facing (above the burners). This is what all kitchen designers hope for...the opportunity to design with built-in cooking appliances. 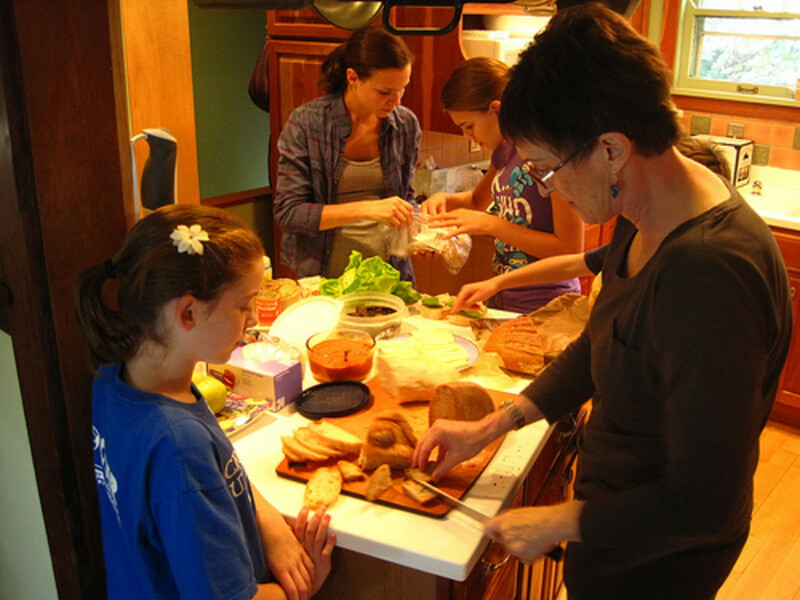 But, the major problem is that many kitchens simply do not have enough wall space to accommodate everything which leads to cramming. Cramming, when combined with the use of several decorative (non-functional) components typically breaks all the rules for functionality. That is exactly the case for the pretty kitchen pictured above....Lots of form, terrible function. I will explain that in another hub. Cooking just does not get more basic than the kitchen at the right. 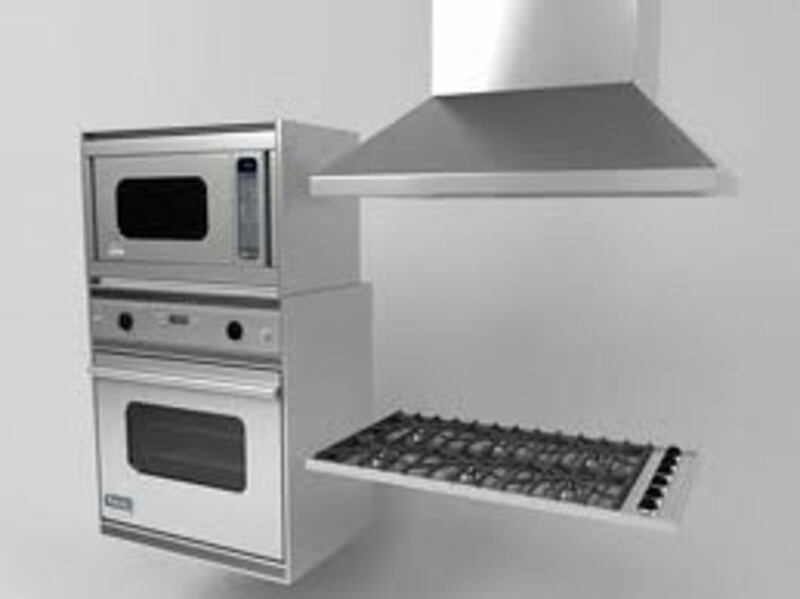 The free-standing Range includes both baking and surface burners. The over-the-range microwave also includes the exhaust fan and the lighting. This is by far the most cost effective means of cooking. That's why you find this setup in every apartment complex in America. Obviously, I hate it. But, built-in appliances require more space and a lot more budget...I mean a whole lot more. A free standing range might cost $1,100 bucks. 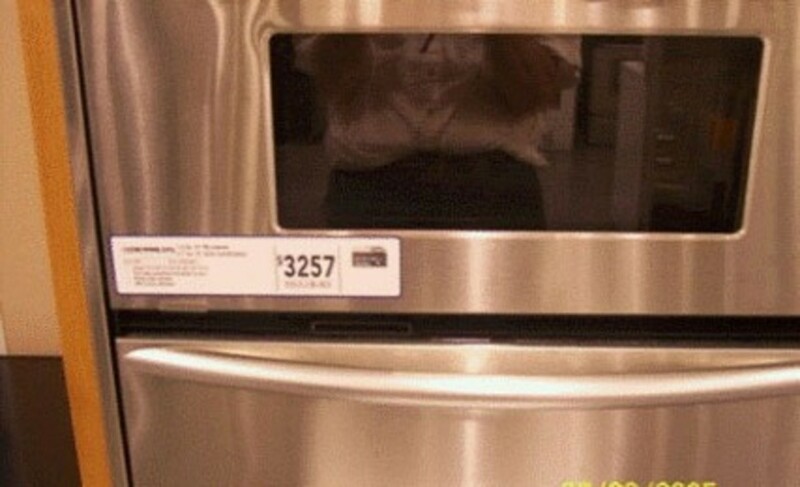 That over-the-range-microwave is about $400. So we've got maybe $1,500 total invested in cooking appliances as shown. 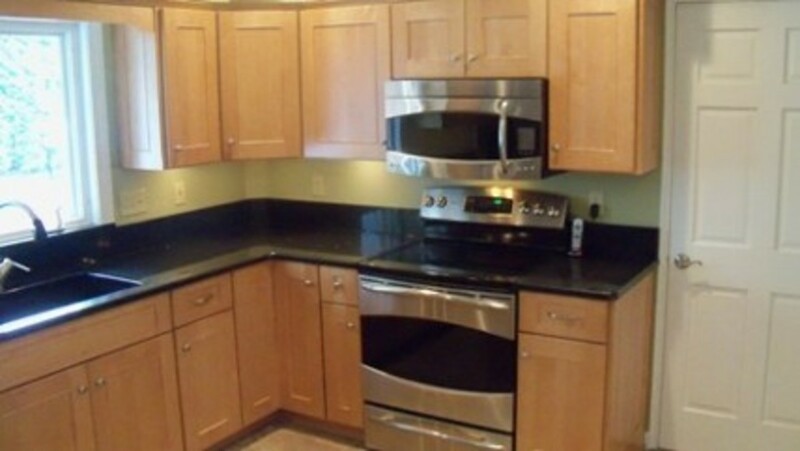 So now let's refer back to the pretty looking kitchen at the top of this page and lets start to compare costs. The elegant woodwork to cover the exhaust mechanism...........add 4,000 ! I don't think I need to add that all up...you get the point. Separating your cooking appliances is way, way more costly because of all the added cabinet, countertop and installation expenses. 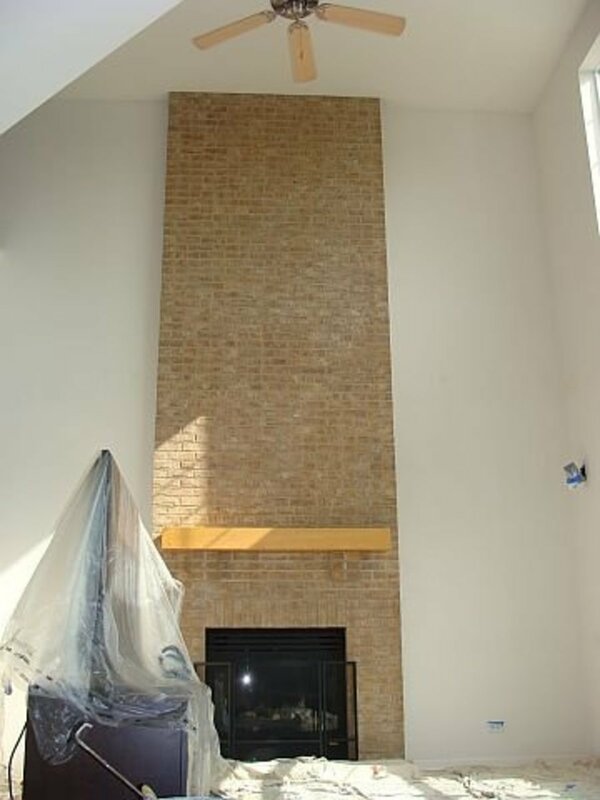 As suggested in the list above the biggest cost variable might be the wood hood canopy.It's funny, the same space that used to be occupied by a nasty 90 dollar range hood, is now the same area used for hugely extravagant woodworking and design details. The images at right show a clever and attractive way to create a built-in look without all of the 'addons' mentioned earlier. The first image at right shows a 30" Dacor wall oven installed into a base opening. 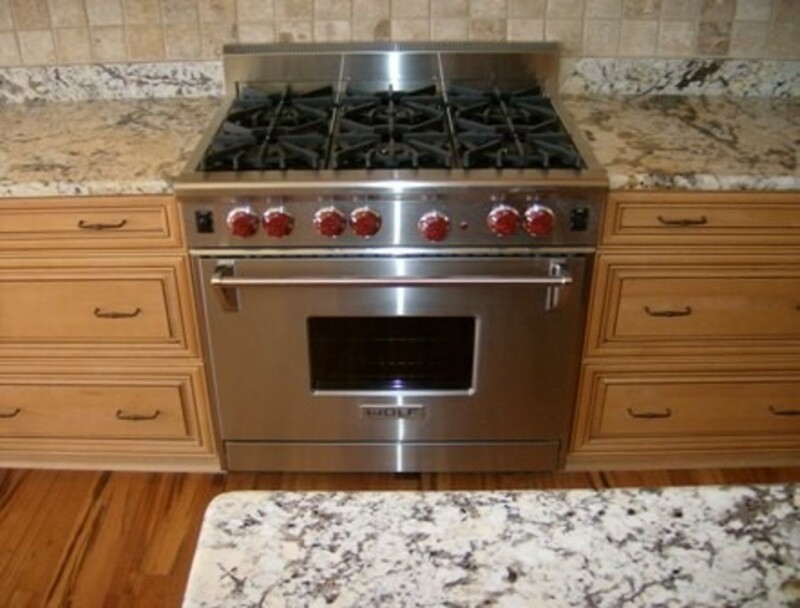 Dacor 30" cooktops are designed to fit into the countertop over the Dacor 30" oven. 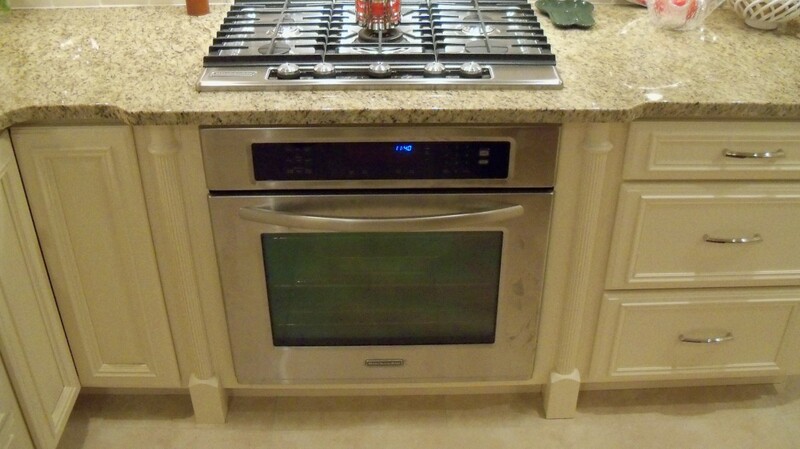 In this kitchen you see a Dacor 5 burner gas cooktop the same width as the oven below it. 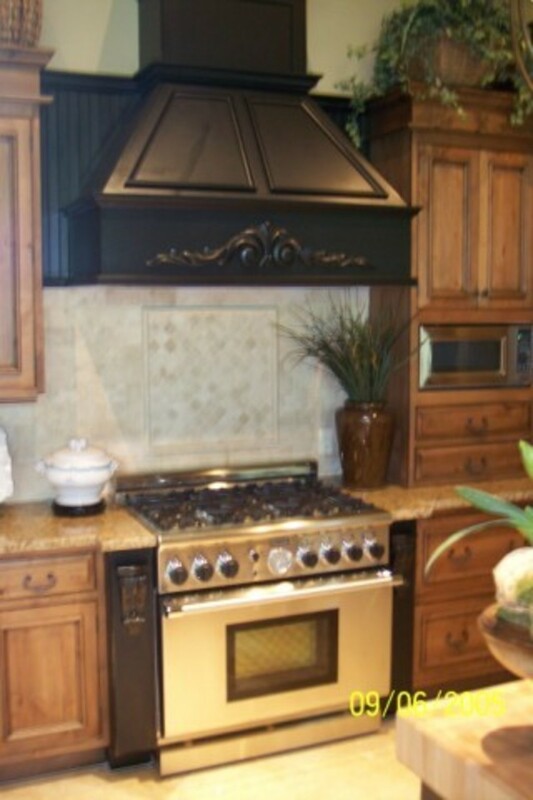 I used a decorative split column pilaster on each side of the oven for enhancement. Note that In this particular kitchen the microwave is out of your view, but trust me, it is placed right beside the counter depth refrigerator where it belongs and just out of sight here. 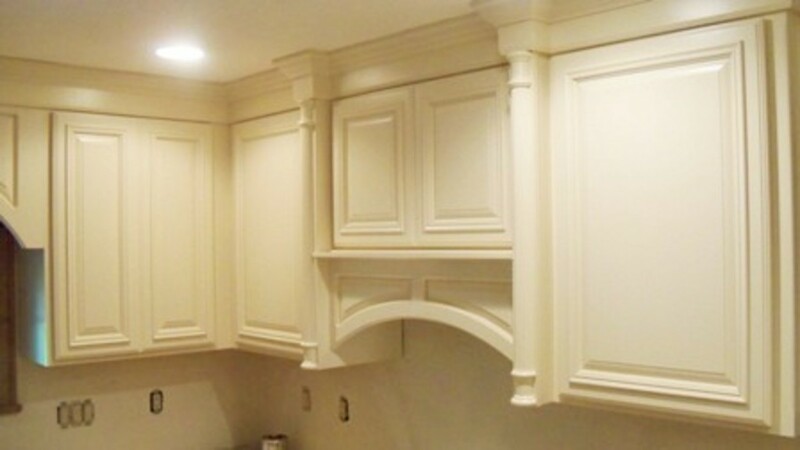 The third image is showing the cabinetry above that cooktop. That upper cabinet contains a simple internal metal liner, twin blowers and lights. 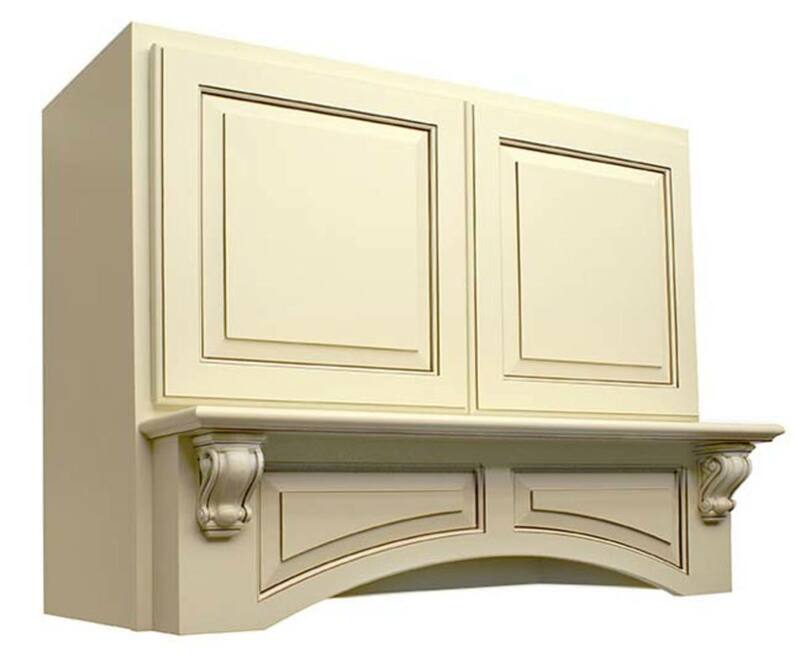 The split columns mimic the details from the base cabinet, The arched valance helps to conceal any metal work and also matches the arch over the window. Using a separate cooktop and oven creates a nice unbroken look, and allows for decorative tile backsplash to continue through. 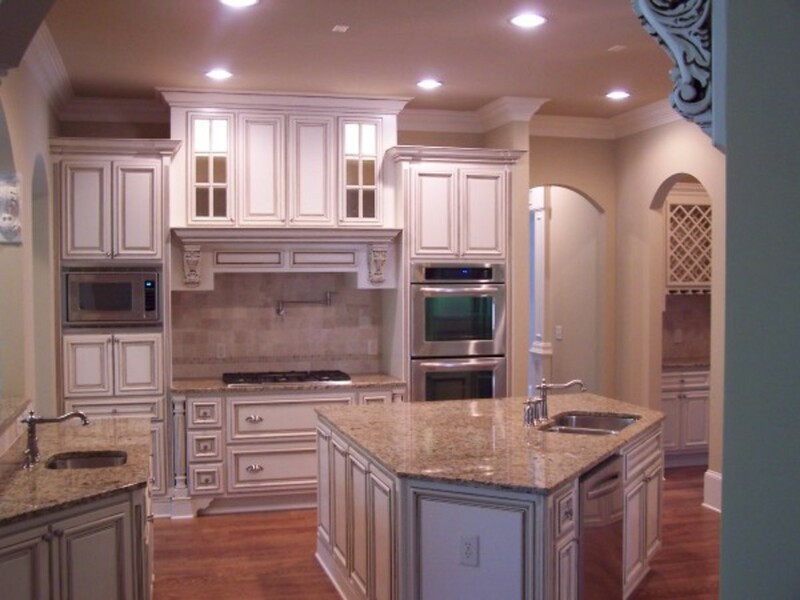 Finally, the finished kitchen is shown below. Take a close look at the cooking wall. Then go back up this page and compare to the freestanding range...Little better ?? First thought..."Can't afford it"..."Won't fit."..right? Well you might need to rethink that !! These eye-popping Ranges are available as small as 30" and up to 60". Pricing will range from $3,500 to 10,000 bucks. But, but, but...I want you to go back here to the added price consequences using built in cooking appliances. 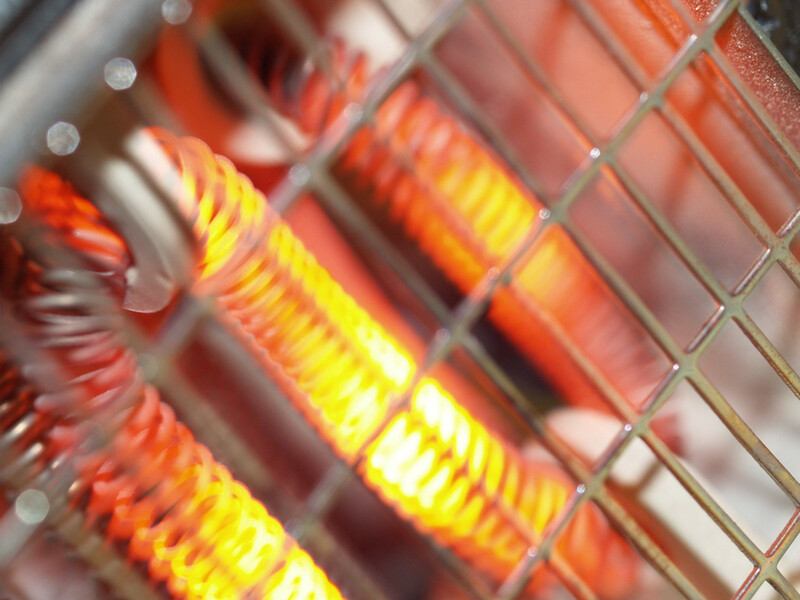 If you take the actual appliance costs and add all the extra costs incurred because of the required cabinets, the added counter costs, all the wiring and extra installation costs...you are going to get to $6 - 7,000 really fast!! What extra costs are involved using a Viking or Wolf range as pictured here?? Very little. It will just slide into an empty space. Get it ?? 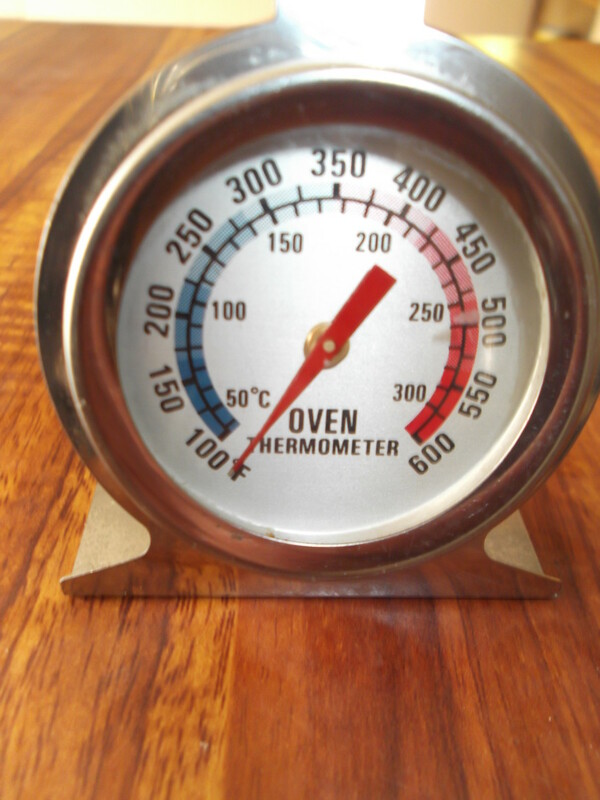 The whole point of this article is to be aware that your choice of cooking appliances can have a dramatic impact on the overall costs and function of a new kitchen. Your new cabinets, countertop and appliances are intertwined in many ways. You need the advice of a professional Kitchen Designer before you make any assumptions or make a compulsive appliance purchase on your own. What not to do...Do not just jump on Ebay and buy a $6,000 Range (as pictured) unassisted. That's exactly why so many end up on Ebay! 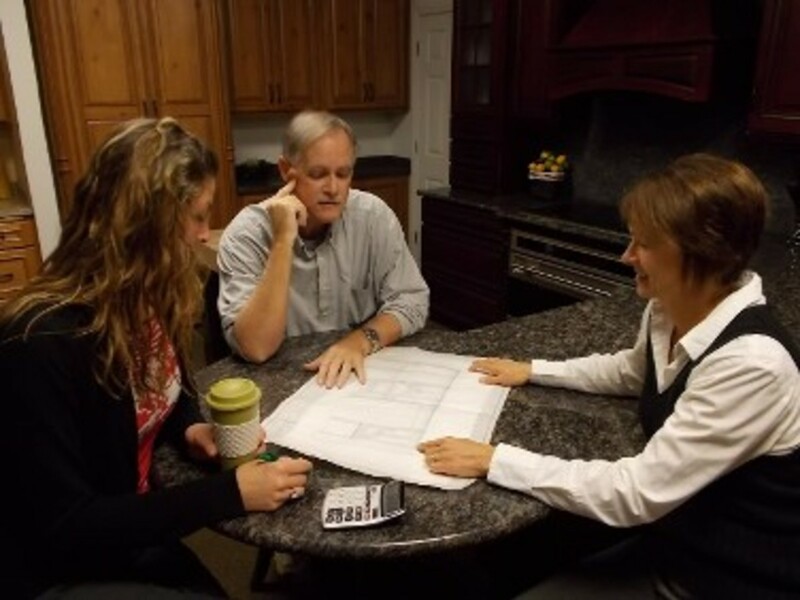 These all have specific details that dictate the involvement and advice of a qualified Kitchen Planner. 36" Wolf range...go for it! Planning your own kitchen....my best kitchen design tips and advice with pictures! 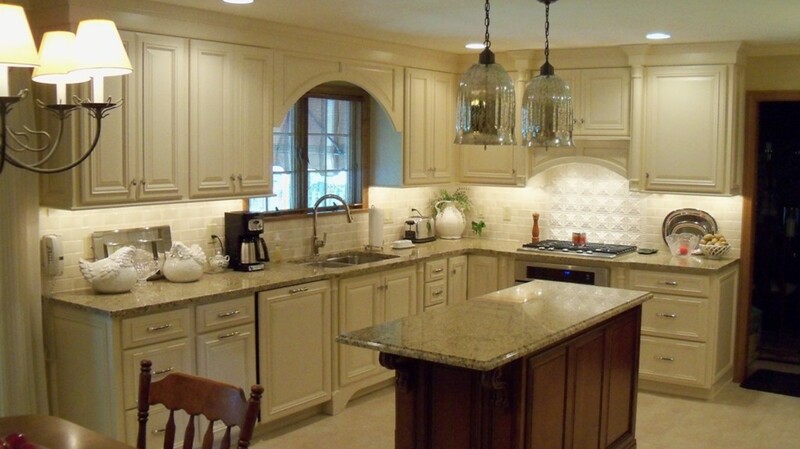 Kitchen cabinets with inset doors are the unmistakable sign of a high quality and truly custom built. 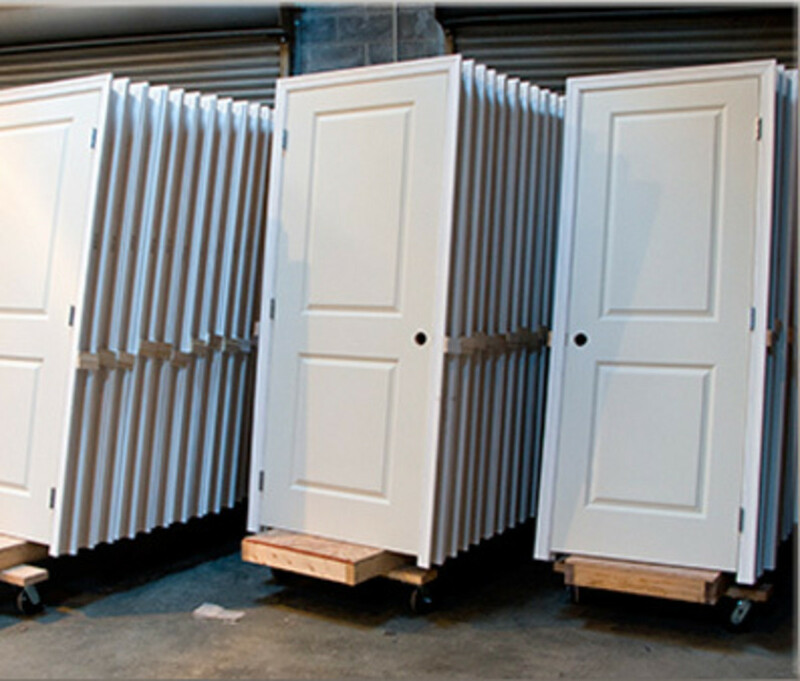 You will not find any mass produced cabinets with inset doors. What you might want to know! Kitchen planning...Choosing the right refrigerator. Your choice for refrigeration is perhaps the single most important product selection. Don't screw it up. Allow me to explain. Dave, this is a great article! I will be reading all of your posts....many thanks for the great advise! Hi. You need to get a hold of me...I make tough budgets happen every day. See my profile page for contact info. Please! I need to show my husband this article! He does not cook....In fact, he can barely boil water. Lucky for him , I am an excellent cook. (He made sure of that before he married me). Almost every night, he says my meals are amazing . Anyhow, my husband prefers a 4-5 course dinner every single night, and he thinks that any good cook should be able to do that. YIEKS! ...However, not being an actual cook himself, he does not understand how difficult that process is,done every single day (ie: to perform that task for 365 days a year. (PS: HE HATES EATING OUT!) ). My kitchen is far from a CHEF's Kitchen. It is a nice kitchen but unfortunately, the appliances were designed for "non-cooks". Thus, I am constantly trying to weave around the 4-burner electric coil cook top and downdraft vent . Therefore , my entire cooking experience involves me trying to move the many pots around , sort of like a Tic-Tac-Toe puzzle...almost every night. 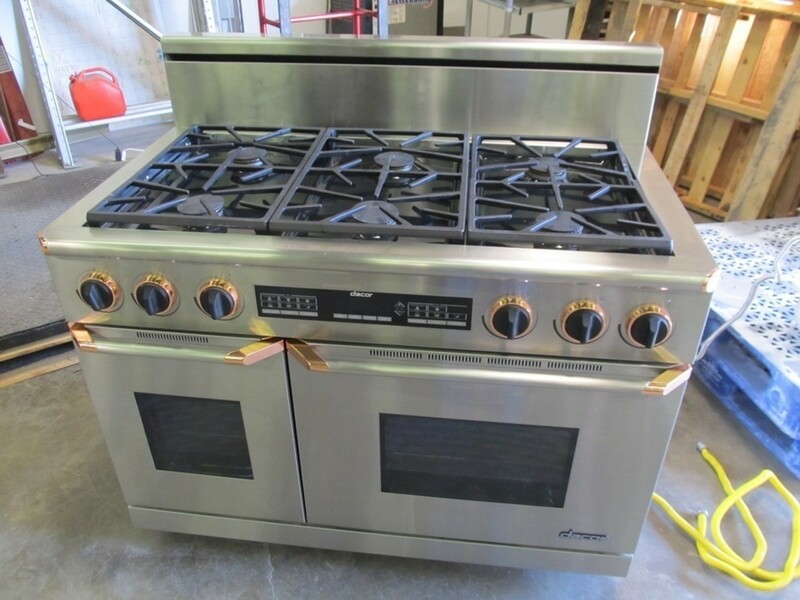 I so would love to have a 6 burner stove . My dream. Also, my oven is tiny tiny and I need a larger oven that is capable of holding a 12 lb turkey (for example). The ultimate would me to own a regular sized oven and then also another one (an extra oven) for keeping things warm, for instance.